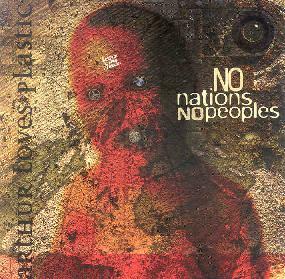 Arthur Loves Plastic - "No Nations, No Peoples"
I had never heard of this band before but it comes from a totally different musical genre than what I normally listen to. Arthur Loves Plastic is a project by a Maryland based musician named Bev Stanton. I did not know what to expect but this is some pretty cool electronic beat music. The CD features several guest female vocalists and loopers. The CD also includes two tracks by a project called Autocad, that were remixed by ALP. The majority of the tracks are instrumental with some samples but no singing and quite cool experimental trippy songs that fit into the electronic music genre but not really techno as there is no thumping bass, just semi-fast paced electronic percussion. This is perhaps the CD I listened to the most in the last month as there was just something about it that holds you, takes you away, makes you want to hear it and follow you around the room. Put this one on while you are doing things around the house and see where it takes you. Pretty cool, fresh music for the mind. Contact via snail mail c/o Arthur Loves Plastic; 6618 Cockerille Ave; Takoma Park, MD 20912.